“Go for it, Kevin!” yelled a kid treading water, gazing up at the cluster of boys who stood maybe 50 feet overhead, staring down from the edge of a cliff. They looked about high school age; cars in the parking lot had been painted with signs celebrating the “Class of 2017.” The boy in white trunks—Kevin, I assumed—looked scared as he stood at the edge, peering down at the water below. With a quick scan of the area, taking in the picnicking families and groups wading in the crisp pools of water, my boyfriend, Jordan, dropped our daypack and walked toward the cliff. “I’m doing it,” he said. His bravado inspired a competitive edge in me, and I followed behind. The pathway to the jumping-off spot was marked by the wet footprints of those who had climbed up before us. I was only slightly nervous about the climbing itself—mainly it was the jumping that gave the soles of my feet a nervous tingle. What I knew as I got closer to the smooth rocky platform at the top was that there would be no climbing down this path—the only way you get down is through the air. I sank into my seat, nervous that we had chosen the wrong destination. With only a week to explore LA and its surroundings, we had to be choosy about what we did. I turned my head out the window, taking in the palm trees and pastel colours of the city. The author and the rented Beetle. The very concept of “Malibu” has been co-opted, appropriated and made to fit any number of ideas—a quick Google search brings up Miley Cyrus’s 2010 hit, a strong rum cocktail recipe and a mid-size Chevrolet. Anyone looking for a quick coastal adventure may, as a result, overlook the city, with its small-town feel and 20-plus beaches. But after a full day of exploring, it proved to be a place of limitless activities for those hankering for an escape. After a morning spent at the foggy Paradise Cove beach and a drive up the hills of Malibu’s private Murphy Road, where actual mansions have actual unicorns on their stained-glass windows, Jordan and I drove to Malibu State Park, an 8,215-acre park established in 1974, to explore the trails and creek pools. Yes, people actually live here. Jordan and I looked at each other. “That’s close to boiling,” Jordan said. The park ranger turned back to his coworker. “Sorry, 38. Also just so you know, there are snakes out today. And bring water—I hate dealing with dehydrated people, because that’s just freaky.” He shook his head, reliving the horror of those memories. We paid the $12 parking fee and entered the park. 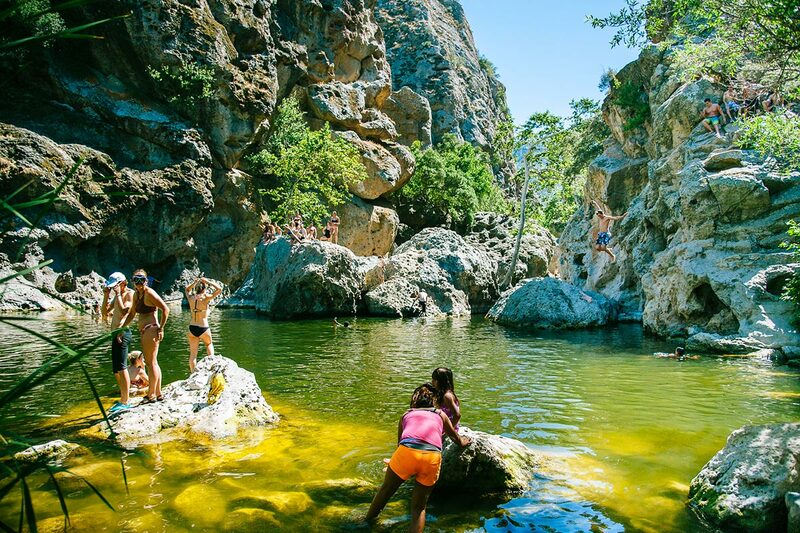 You can jump, dive and dip in Malibu’s pools. 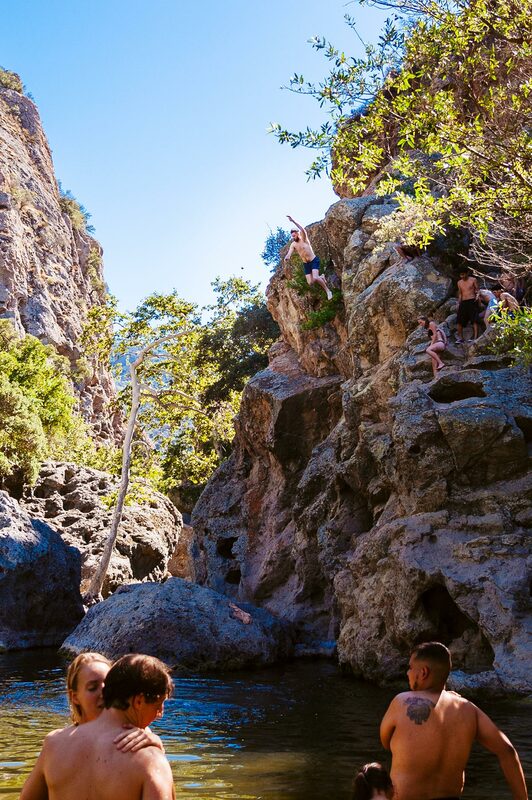 Of all the hikes in Malibu, the park’s beginner and family-friendly trails promised creek pools where you can jump from moderate-sized cliffs into cold water. Growing up with cottages in Ontario, Jordan and I spent many childhood summers jumping into lakes, making this an opportunity we couldn’t pass up. I hadn’t done it in years, and part of me was scared I’d lost the courage of my fearless youth. Jordan confided that he had lately developed a fear of heights. We slathered ourselves in Hawaiian Tropic sunscreen and set out across the dirt road, behind a boisterous family of little girls in bright pink bathing suits and young boys with baggy T-shirts. The paths were busy with people walking in swimsuits and cut-off shorts, either back from the pools or toward them. The numerous winding trails can be combined to make the walk a little longer if you want, but the most efficient route to the pools is to follow the Grassland Trail to Crags Road and then turn onto the Rock Pool Trail. If you’re ever in doubt, asking for directions was common on the walk. As we approached the end of our walk, the swell of voices greeted us like we were approaching a frat house. Cheering, yelling, whooping; the calls of victory. It took us about 25 minutes of flat ground to walk this far and my throat was already dry from the dusty journey. Jordan considered the heat calming. “The only option is to relax,” he said as he crossed under one of the brief shaded areas, a canopy of enormous oak trees. I kicked the dry desert and took off my hat, running my fingers through my sweaty hair. At least it was pretty—the view from the path was of the Santa Monica mountains. 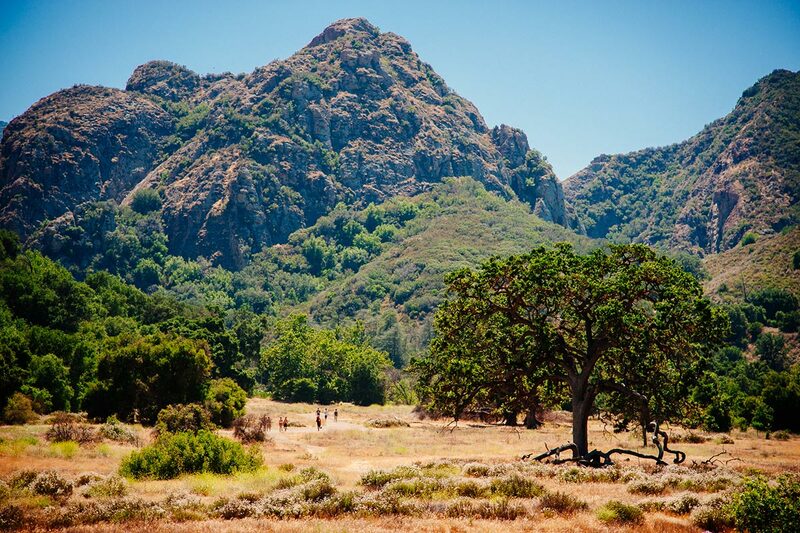 I searched for signs of water beyond the trees and rocks; to our left, the dried-up Malibu Creek was a sad sight. It’s sometimes dangerous, but people jump into these pools every day. Another united cry came from straight ahead, and I knew that we were getting closer. Once we reached the pools we found people sprawled across the rocks, floating in the water and up on the ledges, where white knuckles gripped nubs of rock. There was a surprisingly pleasant etiquette at the top of the cliff, where we found ourselves standing among the young bros, about to leap into the abyss below. Nobody hurried the person ahead to rush their battle with their nerves. The boys gave a look to Jordan and leaned back, allowing him through. I watched as he placed his foot at the very edge of the rock, bent his knees and leapt. As I respected his moment of hesitation, it only prolonged and heightened my own anxiety. 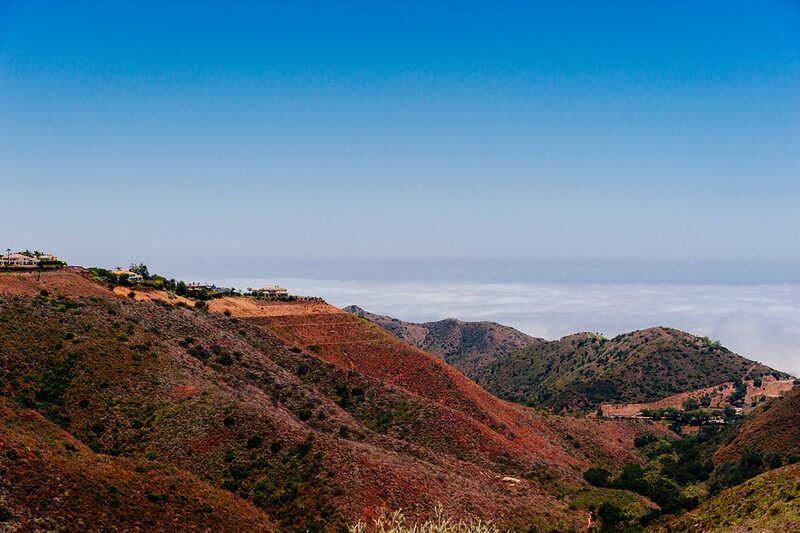 Emergency rescue teams at Malibu State Park say they get called two or three calls a month, according to the Malibu Times; jumpers have broken bones and been hospitalized. My decision to climb had been impulsive and easy, but the choice to jump was torturously drawn out. Atop of the highest cliff. In reality, the moment of hesitation took no longer than seven seconds. I quickly assessed the cliff’s height and took a moment to prepare my body for the best leap. I was the only one that yelled as I soared through the air—the thrill was familiar, and I was reminded, as I popped my head above water and gasped for air, how these small triumphs leave you buzzing for the rest of the day. 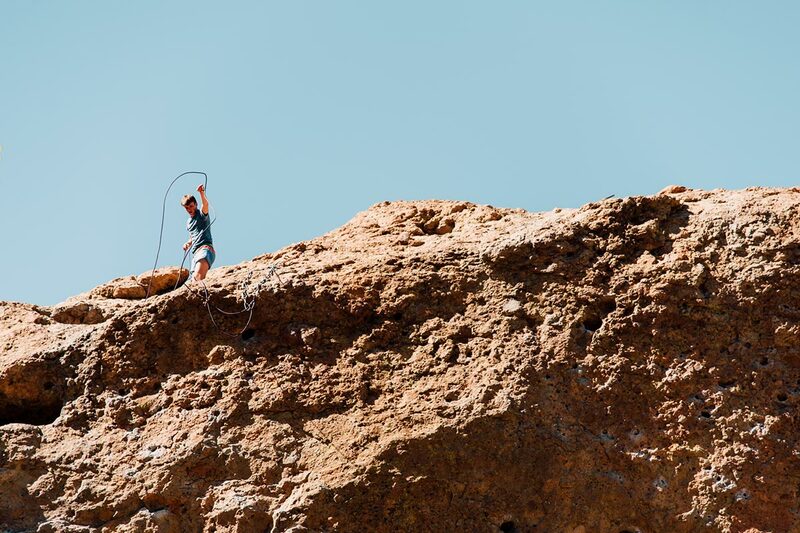 Along the edges of the pools were a group of climbers with ropes swung over their shoulders, casually crawling up the walls while music played weakly from their backpacks. All around were the wild calls of people splashing, encouraging and hyping up one another. After he jumped, Jordan, too, scrambled up the rocks to the higher peak. I watched as he reconsidered for a second and then hauled his body through the air. Everything about the day felt limitless, from how high you could jump off a cliff to the amount of activities one could cram in to a single day. Back on the dusty paths we let our bodies dry in the heat of the sun, taking pictures with the mountains and reliving the rush of falling. We climbed back into the car and took off toward Zuma Beach, where we watched the sunset while jumping in giant waves. By the time we started back for LA, I was wiped. My whole body slumped into the seat, and I couldn’t believe we’d only been gone for a day—the telltale sign of a day trip done right. You should always feel exhausted by the end, and you should always feel you’ve pushed yourself to your limits. I watched as the tops of buildings rolled back into view, gazing at the billboards of movies and TV shows, my body still buzzing from our little adventure.